Live commentary on BBC Hereford & Worcester online and 104 FM from 13:00 and updates on BBC Sport online. Worcester winger Nikki Walker is fit to finally make his delayed debut for the club in Saturday's Premiership derby clash against Gloucester at Sixways. The 30-year-old summer signing has not played since injuring his knee playing for Scotland against Italy last August. He was then hampered by a pre-season shoulder blow but is now fully fit. "He is available. 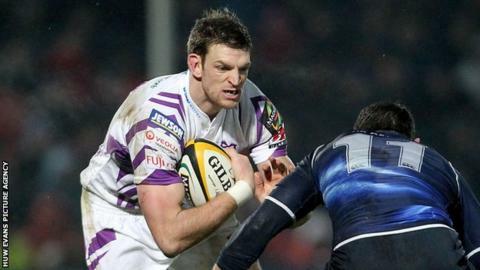 I've just got to make that call now as to whether we bring him in," coach Richard Hill told BBC Hereford and Worcester. "It's a tough one, but he's been training with us. "Last week was a little bit light but this week he has begun full training with us. "He'd had a good pre-season until he popped his AC joint, but he's been without rugby for almost 12 months now." Worcester go into the game at Sixways still looking for their first league win of the season. But the disappointment of the narrow opening day 24-23 home defeat by Bath was then followed up last weekend's encouraging showing in a 34-26 defeat at Leicester. And Hill is confident that, if they can keep matching that level of performance, the results will come. "The way the players are trying to play I am sure we will get better and better throughout the season," he said. "However, for coaches, supporters, the owners and the players a win would be huge this weekend. "Training is a lot easier and a lot more pleasant if you have won a game. "We haven't yet, so we need to get that first win as soon as possible. "I have got a lot of confidence in the squad and I was pleased with the replacements who came on in the second half against Leicester. "Ollie Hayes, James Currie, Craig Gillies and Matt Kvesic came on and all played well. "I am not necessarily going to stick to the same line-up and there will be a few changes."